IMPORTANT NOTICE: The electronic submissions form for Fantasy & Science Fiction will be closed temporarily from 12:01 A.M., Pacific Time, U.S.A., on Tuesday, July 18, 2017, until 11:59 P.M., Pacific Time, U.S.A., on Friday, August 11, 2017. F&SF’s editor, C.C. Finlay, will be teaching the final two weeks at the Clarion Writers Workshop at the University of California, San Diego, this year and won’t be available to keep up with new submissions. Because of the temporary closing there is currently no waiting period between submissions. Paper submissions via the postal service will still be open, but since there won’t be anyone in the office to answer them, it’ll be faster to wait for the online form to reopen. When it comes to paper submissions vs. electronic submissions, our editor strongly prefers for writers to use the online form whenever possible. The online system is free to use and it means that you don’t need to worry about the cost of postage or stamps. In addition, using the online form will give you a tracking number, so you can follow the progress of your story through our system. On our end, it lets us keep all correspondence about a story in one place while putting the submission on our to-do list every day until we reply. Electronic submissions take about a quarter of the time to handle administratively, giving us more time to read the stories and pay attention to the writing. And the first thing we have to do when we buy something sent by snail mail is contact the writer and ask them to send us an electronic file! Our current median response time for online submissions is about 4 days, so the turnaround is also usually going to be faster for online submissions. 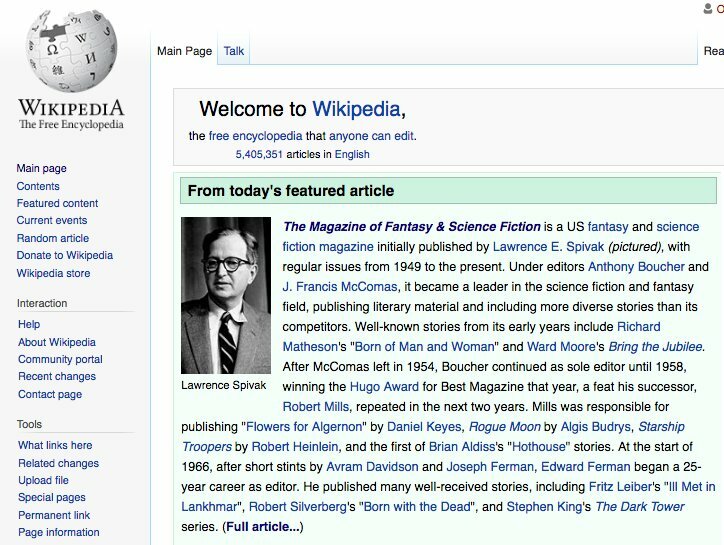 Today’s Featured Article on Wikipedia is The Magazine of Fantasy & Science Fiction. Almost 68 years of great and groundbreaking stories. Weightless Books is celebrating by running a one-day subscription special. 50% off the current issue and 25% off any subscription. But you’ll need to act fast! The September/October issue of The Magazine of Fantasy and Science Fiction is now on sale! The magazine can be found in most Barnes & Noble stores, as well as many local independent booksellers. You can order a single copy from our website or buy an electronic edition from Amazon or AmazonUK. Or just subscribe now and never miss another issue. Not sure if you want to subscribe? For a very limited time, Amazon is offering a $5/£5 annual Kindle subscription to residents of the US and UK. That’s just $5/£5 for six issues, more than 450,000 words of fiction, plus columns, cartoons, and more. Check it out: Amazon US | AmazonUK. This is the 727th issue of Fantasy & Science Fiction and the 67th anniversary issue of the magazine, which debuted in October 1949. And we think it’s special. David A. Hardy created this cover for the David Gerrold Special Issue. To see more of his work, visit his website at http://www.astroart.org/. David Gerrold hasn’t just had one remarkable career in science fiction, he’s had four or five. His first professional sale was “The Trouble with Tribbles” to Star Trek: The Original Series, which also won him his very first Hugo nomination. He went on to write other episodes for that series, plus the Animated Series, as well as novel tie-ins (including Encounter at Farpoint) and three non-fiction books about the show. His other television work included writing for Tales from the Darkside, The Twilight Zone, Babylon 5, Sliders, and Land of the Lost, where he created the Sleestaks. At the same time, he was building a career as a classic science fiction writer of ideas, whose early novels included The Man Who Folded Himself and When HARLIE Was One (1972), another Hugo and Nebula finalist, and one of the first works anywhere to describe the idea of a computer virus. He followed that up with a career writing science fiction adventure series, including both The War Against The Chtorr and Star Wolf books among others. And throughout the decades, Gerrold was writing short fiction, which, in the early 1990s, took a personal turn that elevated his work to a whole new level. When “The Martian Child,” a story about a single gay father raising a young boy who believes he’s an alien, was published in F&SF in 1994, it won the Hugo, Nebula, Locus, and HOMer Awards, and later was made into a feature motion picture. It was the first of many much more personal stories that have redefined his career again over the past twenty years. Gerrold has also long been both a behind-the-scenes and vocal advocate for more LGBTQ representation in science fiction, particularly in the Star Trek universe, a goal that was finally realized this summer with the release of Star Trek Beyond. But this is a double-sized issue so it includes a double-sized amount of great stories, starting with “Talking to Dead People,” a moving new story about murder, loss, and artificial intelligence by Nebula and Sturgeon award-winning author Sarah Pinsker. Lisa Mason explores the future of interactive television in “Anything for You.” And we bring you an alternate history novelet by Geoff Ryman; “Those Shadows Laugh” revisits the premise of Charlotte Perkins Gilman’s novel Herland, and considers how it might look in the modern world. On the fantasy side, we offer “The Green-Eyed Boy” by Peter S. Beagle, a new tale about a very familiar wizard set in the world of The Last Unicorn. We also offer “The Sweet Warm Earth” by Steven Popkes, a more contemporary fantasy set in the world of horse racing and gangsters. We also have a new poem, “The Dragon” by Aimee Ogden, who is making her first appearance in F&SF, plus all the regular columns and features. Charles de Lint reviews new books by Seanan McGuire, Michael L. Peters, and others. Michelle West reviews books by Lawrence M. Schoen, Patricia A. Mckillop, and Joe Hill. In the film column, Kathi Maio highly recommends the new science fiction film “The Lobster.” And for our Curiosities column, Robert Eldridge considers The Adventures of Hatim Tai a Persian novel first translated into English in 1830. Plus cartoons by Arthur Masear, Danny Shanahan, and S. Harris. Postal submissions will still be accepted during this period, but replies may take longer than normal. Guidelines for submitting by mail may be found at: https://www.sfsite.com/fsf/glines.htm. Electronic submissions are still strongly preferred. Thank you for your understanding and we look forward to reading your stories.